The highlights of our, now over two-year, journey by bike have been many. 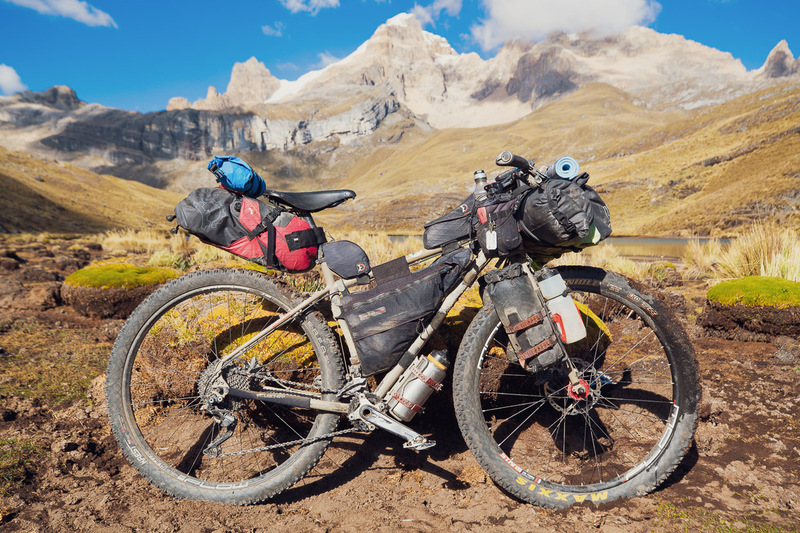 But perhaps the one to trump them all has been our four and a half day ride from Huallanca to Oyon, incorporating the well-known eastern Huayhuash trekking route as a passage to link us onto the Peru Divide bikepacking route. 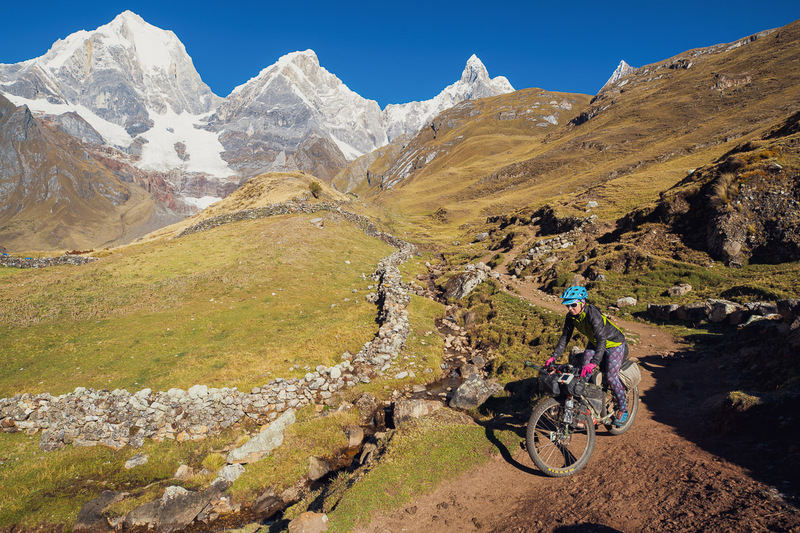 The promise of a thread of epic singletrack through one of the most famous mountain ranges in the world tempted us into the Cordillera Huayhuash and we weren’t disappointed. 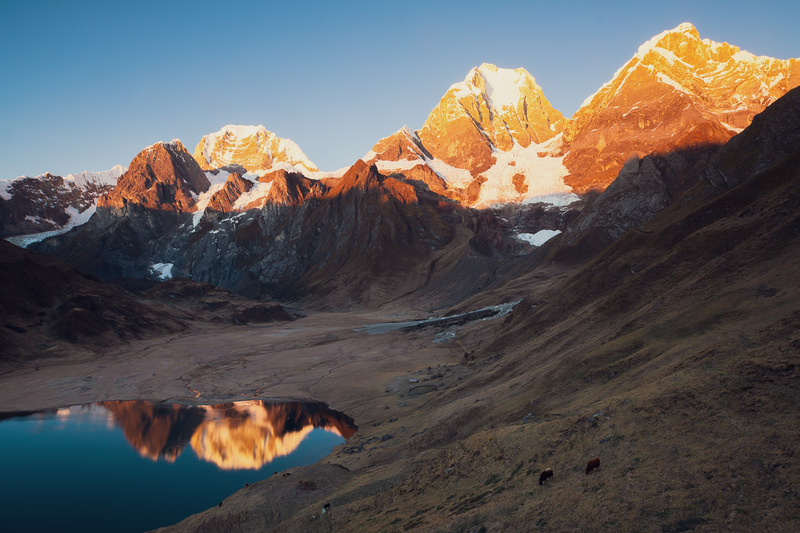 The Huayhuash is a compact yet jagged range that forms an outlier to the much more expansive Cordillera Blanca. 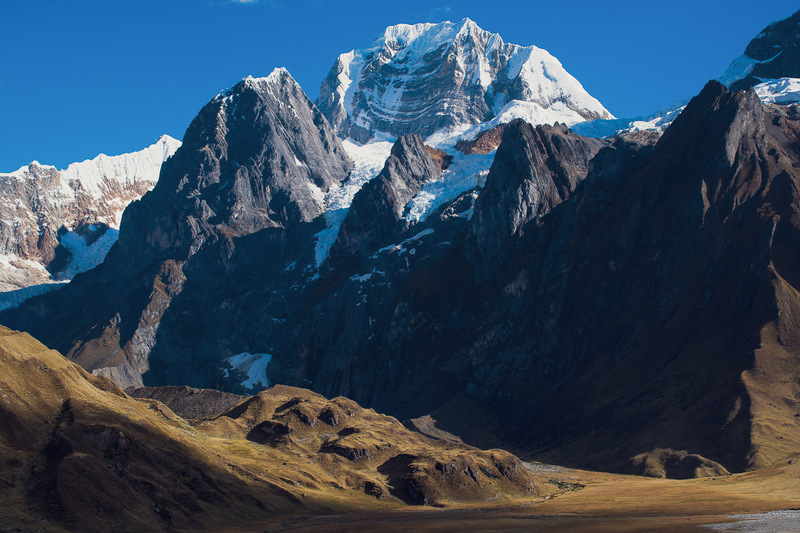 But what the range lacks in scale it makes up for in height, containing Peru’s second highest mountain, Yerupaja. And not only height but verticality: these peaks are spectacularly steep. 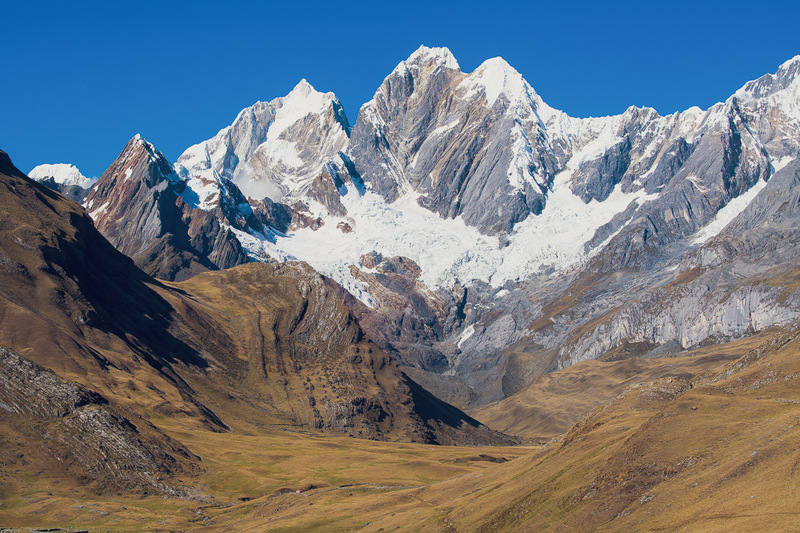 Studying a topo map of the Cordillera Huayhuash pre-trip gave little away. Sure, we could see the closeness of the contour lines and read the passage of the trail. 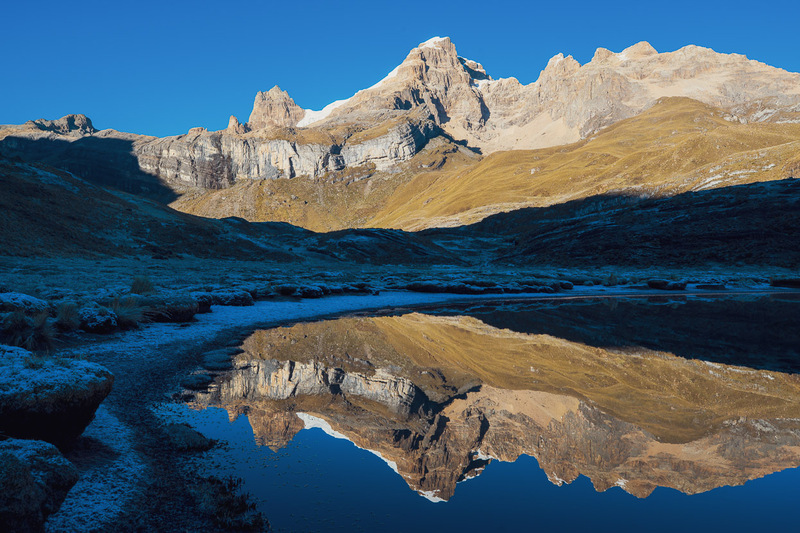 But this still didn’t quite prepare us for the majesty of these ranges with their icy peaks, exposed rock, picture perfect lakes, the mellow curves of the glacial valleys and intricate features of the limestone landscape. It’s a photographer’s paradise. Few people have ridden through here and the reports we found varied from suggesting the bike be left at home to ‘Eminently rideable.’ Heading in there the only aspect we’d feared was the riding to hike-a-bike ratio. But what’s made this section so amazing and memorable has been that the ratio definitely favours riding – more so than we expected. 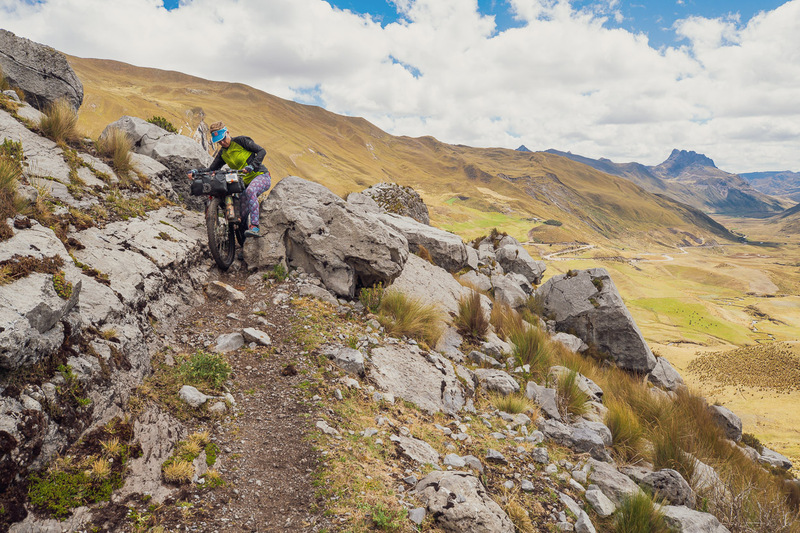 So when you combine epic single track and manageable pushing on the steep sections of the passes, you’re set up for a pretty good time. 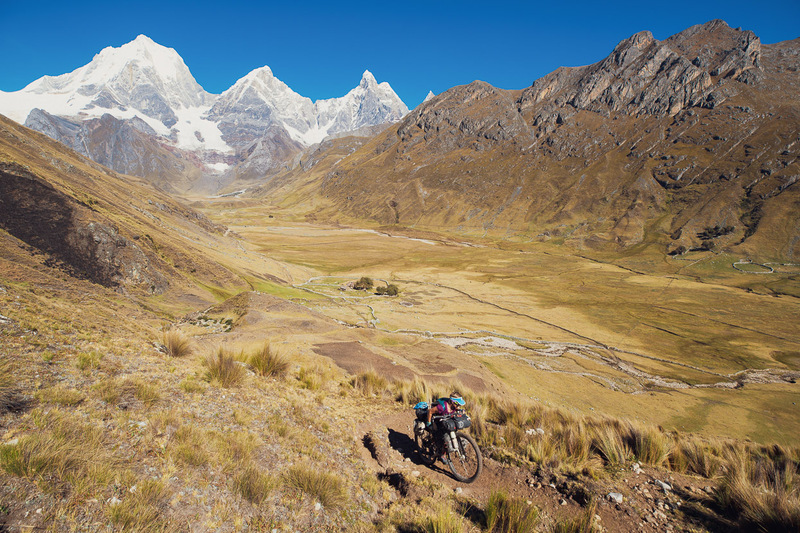 But it hasn’t just been the location and setting that’s elevated this experience to the top of our ‘best rides’ list, it’s also been the fact that it has coalesced everything we’ve learned and the fitness we’ve gained over our couple of years on the road into a kind of zenith of our bikepacking experience in the Americas. 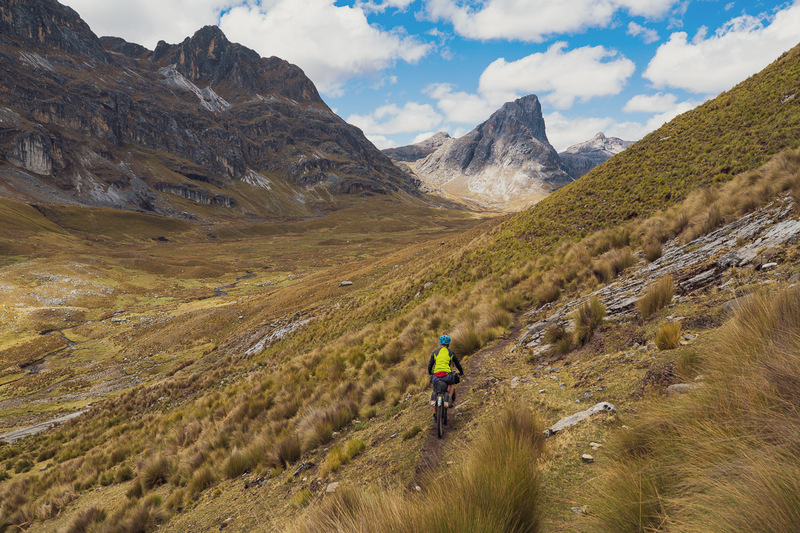 In retrospect the difficult TEMBR singletrack section we took on in Ecuador and the Portachuelo de Honda in the Cordillera Blanca set a high bar for hike-a-bikes and because the Huayhuash felt easier than those tests it was all the more sweet. We got an early start out of Huallanca after an overnight in town. 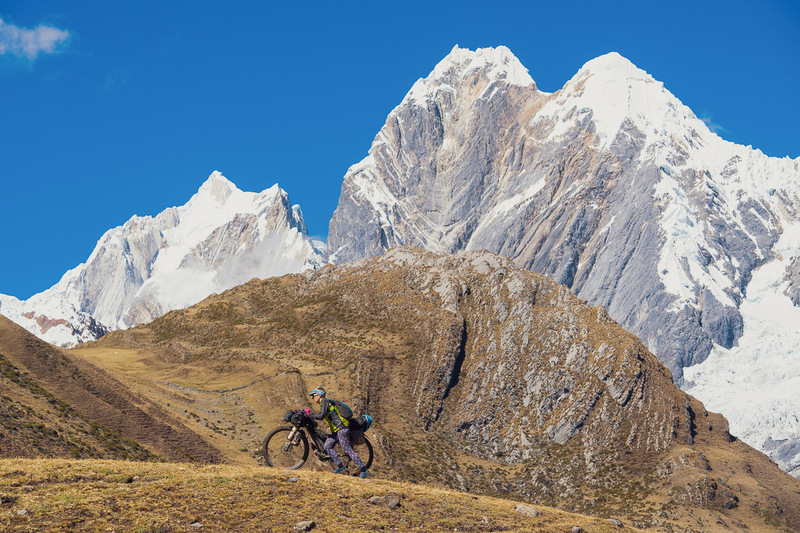 We’d originally planned to just resupply here and ride on towards the Huayhuash the previous day. But after a high acclimatisation camp at over 4800m the night before we were feeling quite drained, so decided to take the afternoon off and catch a strategic low sleep for recovery. 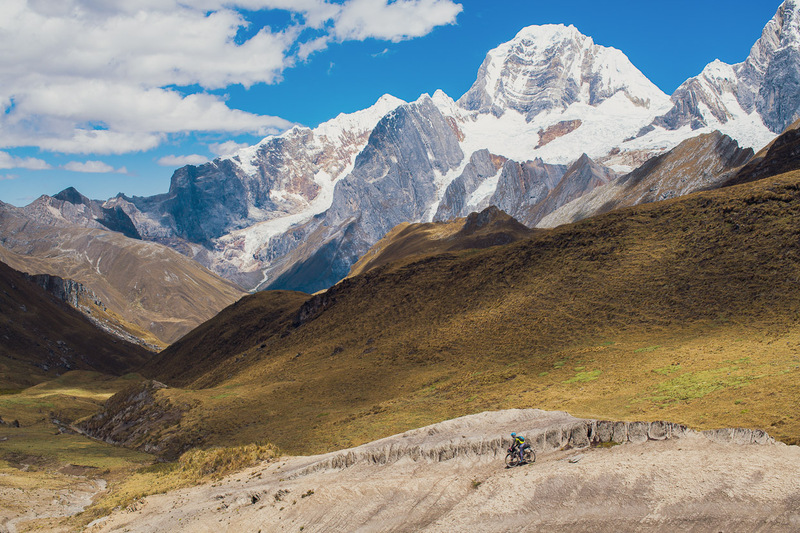 This definitely paid off, as we rode into the tough sections of the Huayhuash feeling fresh and well acclimatised. We headed south from Huallanca, gradually climbing on a good dirt road. We saw few people, but this young lady chatted to us from her high perch for a little while, before trotting off to tell her family all about the gringos. Further up the road they all waved as we rode past. After roughly 22km we turned left onto a rock littered 4WD track that climbed further for around 500m and ended at a gate. From here it was around 5km of single track until we rejoined a road. We’d read some pretty bad reports of this section, but for us the first 500m were the worst, with a few limestone blocks and sections of rocky track to negotiate. After that the trail was mostly (70%) ridable for us, as it sidled – gradually climbing – along the side of the valley. It’s a good, visible ground trail most of the way although narrow and tussock-choked in places. Just after the first, most technical, bit we passed a small farm where we found a family shepherding a stone-walled corral full of sheep. An old woman and two young boys approached us. The boys hid shyly behind the woman’s legs, but she was all smiles. We exchanged greetings with the formality that’s commonplace in Latin America. She made us feel welcome. “Podemos pasar?” we asked, making sure it was okay to pass. Our explanation of where we’re going was met with nothing more than a shrug of the shoulders. She didn’t think we were crazy. The woman dug her hand into a small bag and pressed a handful of toasted maize into each of our palms with a smile. “Vaya bien!” she said as she waved goodbye. 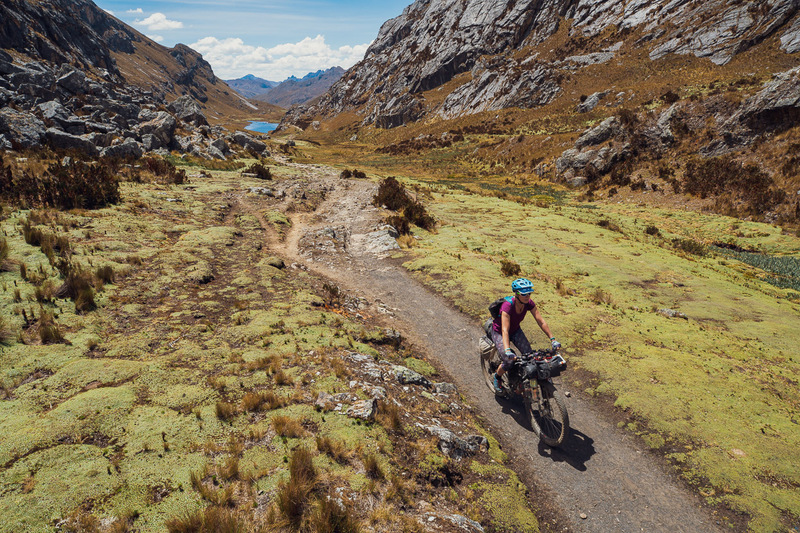 We rode through most of the spectacular valley beyond, passing beneath angular peaks and massive cliffs, only sometimes having to push our bikes. Interestingly this 5km single track section is indicated as a road on Open Street Maps. It’s not shown at all on Google Maps. 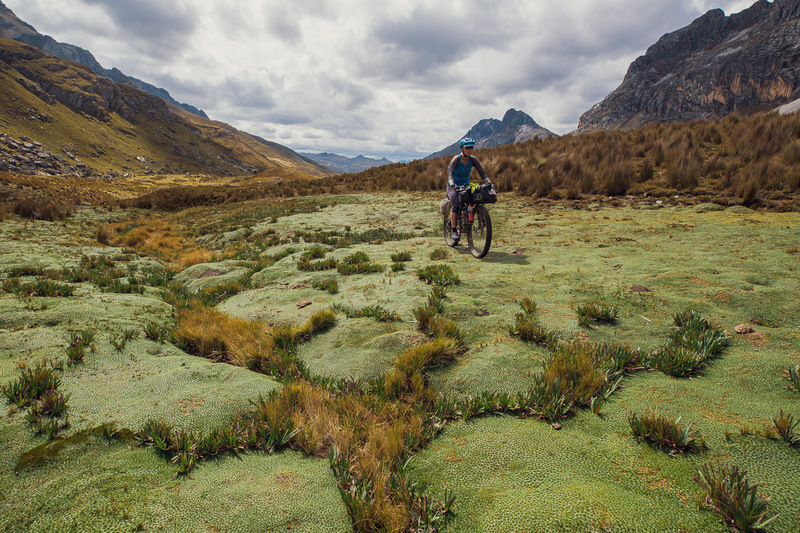 Just before we joined a 4WD road again the trail ended and we rode over the top of this dense mat of azorella. This amazing stuff grows in wetland areas (drainages, edges of tarns) in many places in the Andes. 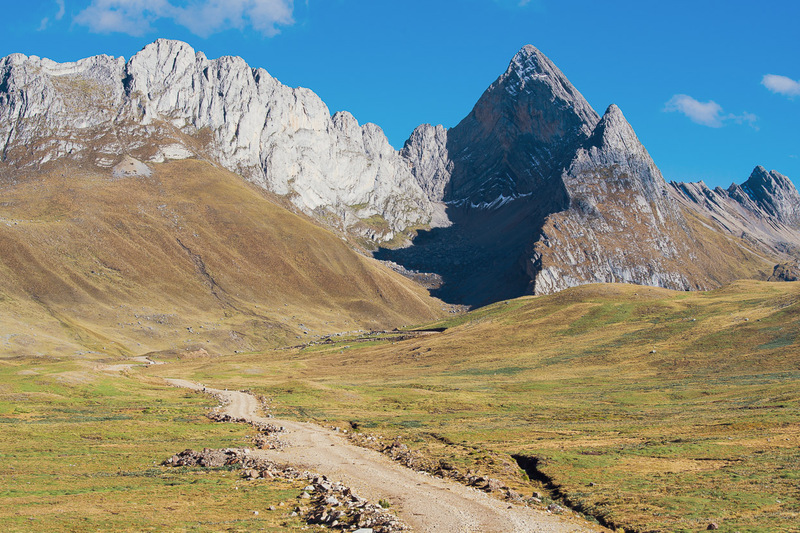 From there a good road carried us over the Abra Cuncush (not named on the map) at 4520m. 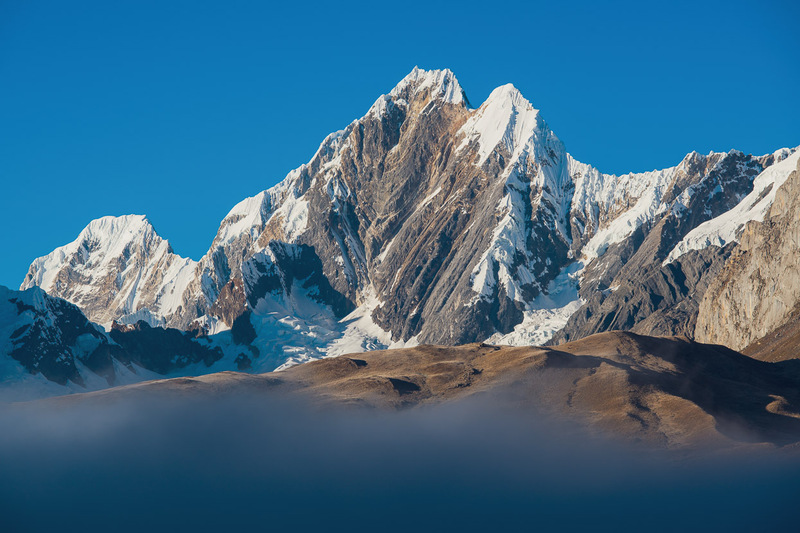 From the pass we got our first view into the legendary Cordillera Huayhuash, with clear views of Jirishanca (6094m). 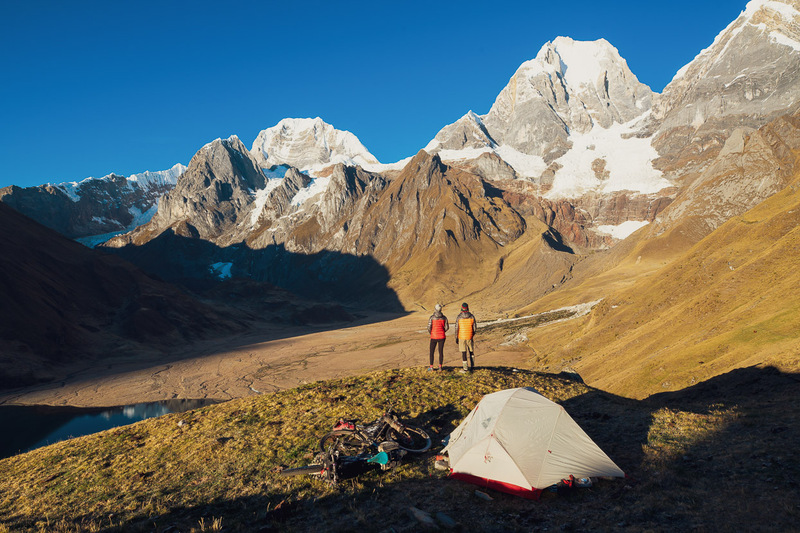 We stopped to camp on a rocky knoll above Laguna Pusacocha. We had time left in the afternoon to push on further but it was such a nice spot it was hard to pass up, even if a freezing cold wind did force us into the tent once the sun was gone. 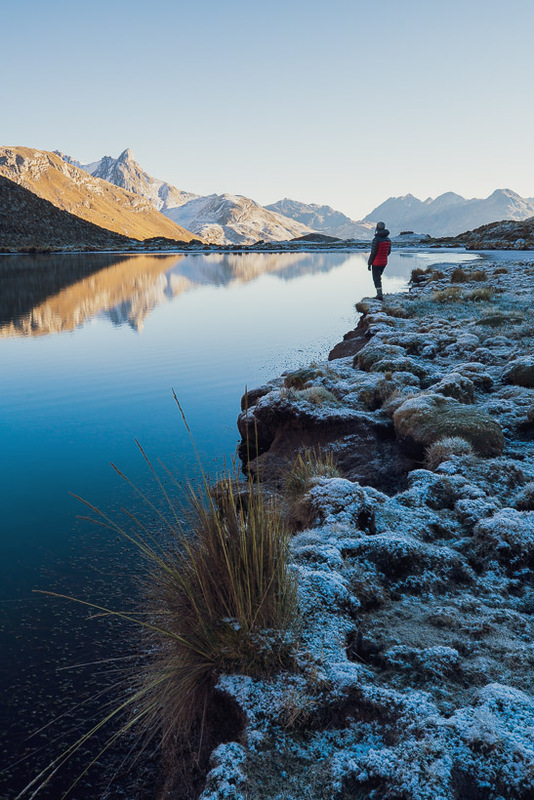 In the morning a freezing inversion filled the valley, but as we packed a frozen tent it slowly peeled away to reveal the peaks we were headed towards that day. We took off down valley dressed in all our clothes, hoping for some sunshine. 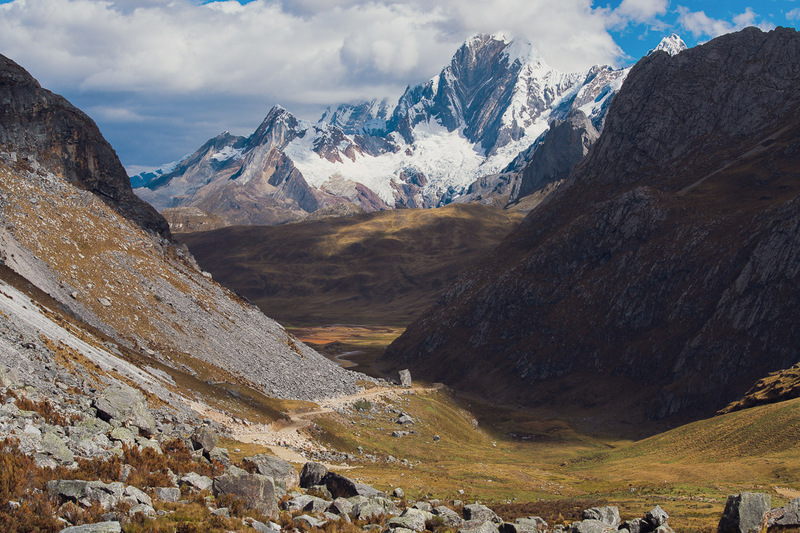 The park entrance couldn’t be more inviting – with a stunning view into the valley and cirque below the north east face of Jirishanca. We entered this valley and turned left over the first pass (in front of the rock layers bottom left of photo). 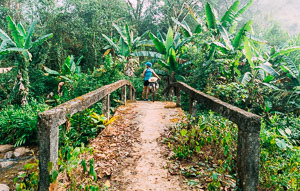 The cordillera is not actually a national park, and local villages each have jurisdiction over certain sections, and therefore each collect a toll from passing trekkers (or in rare cases, cyclists). We paid 40 Soles each (about NZ$19) to a warden in attendance at the entrance and were given a receipt. A grassy climb up the side of the valley soon turned into a push as the track steepened, but it was pretty straightforward. Not a bad place to push your bike! After the initial steep push to get into the bowl of the upper valley we could mostly ride until we reached Carhuac Pass at 4620m. 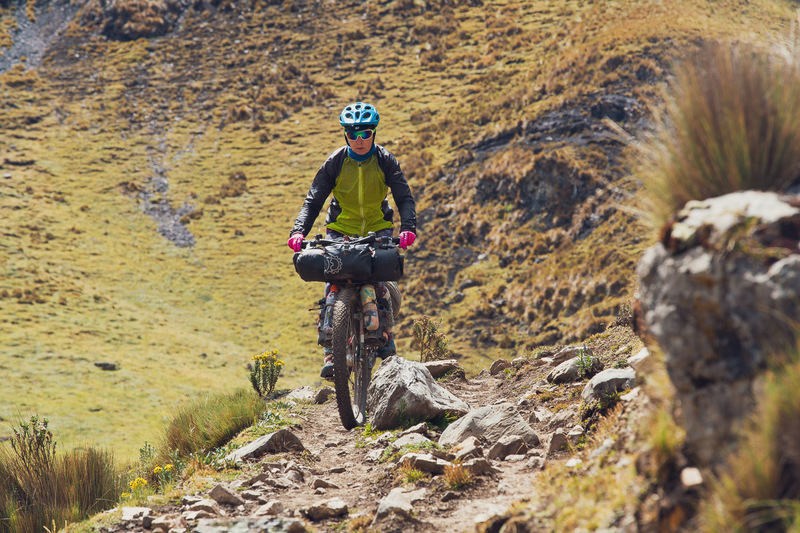 From there we dropped into a mostly ridable descent that ends spectacularly overlooking Laguna Carhuacocha and the dramatic eastern wall of the cordillera’s highest peaks. Dodging rocks and drumming over the holes left by burro hooves. This was a jaw dropping view and as soon as we saw it we knew we were going no further that day, despite it being only 2.30 in the afternoon. 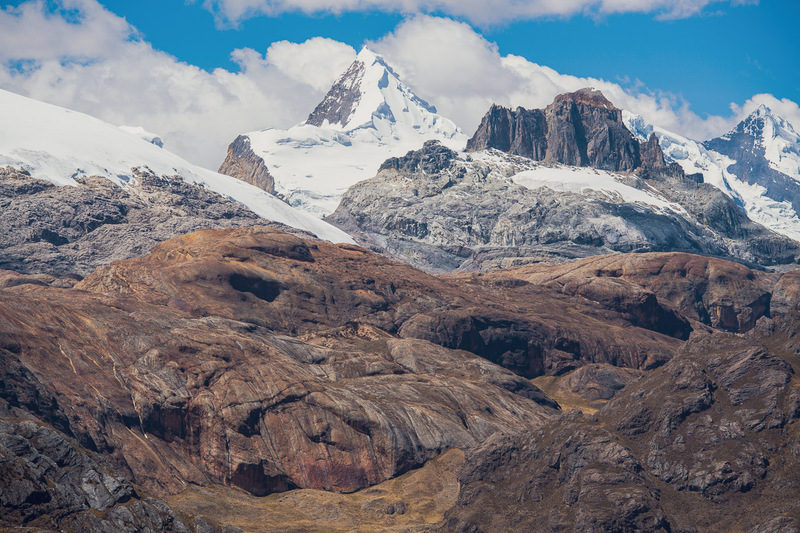 From left: Siula Grande (6344m) made famous by Joe Simpson’s mountaineering survival story Touching the Void; Yerupaja (6635m); Yerupaja Chico (6089m). 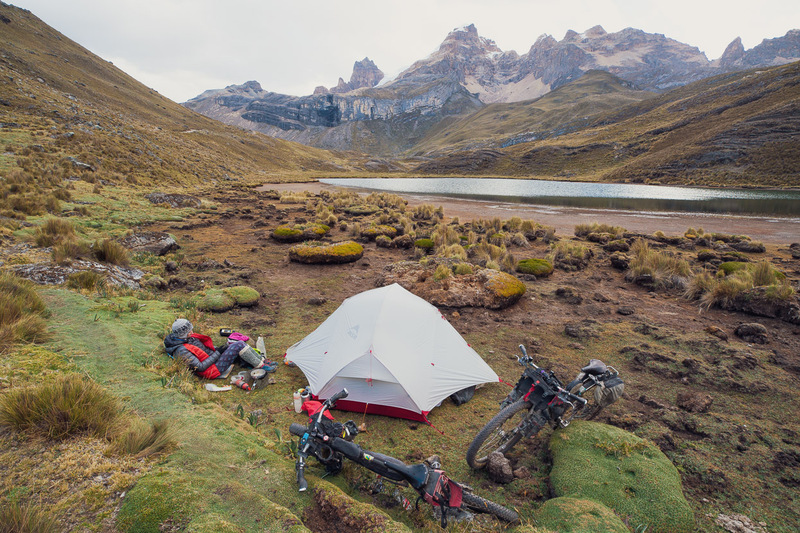 We pitched the tent with a grandstand view and kicked back for the afternoon, brewing coca-leaf tea (it helps with the altitude) and watching shadows fall across the valley. A few trekkers, interested to see two cyclists this deep in hills, stopped by to chat. 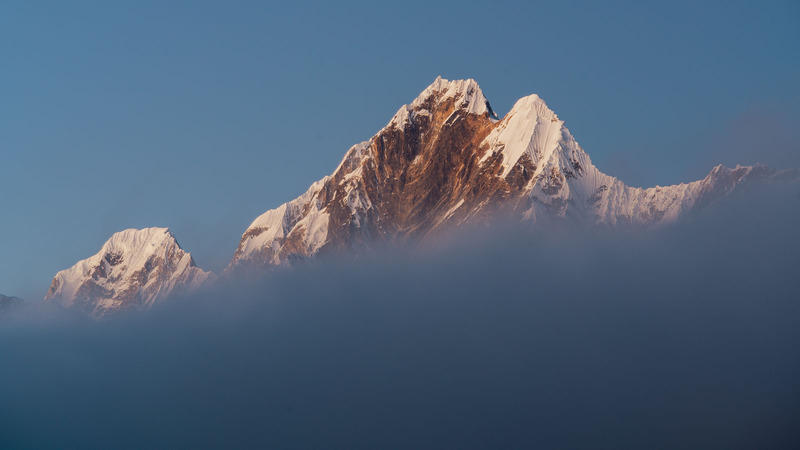 Dawn on the eastern faces. 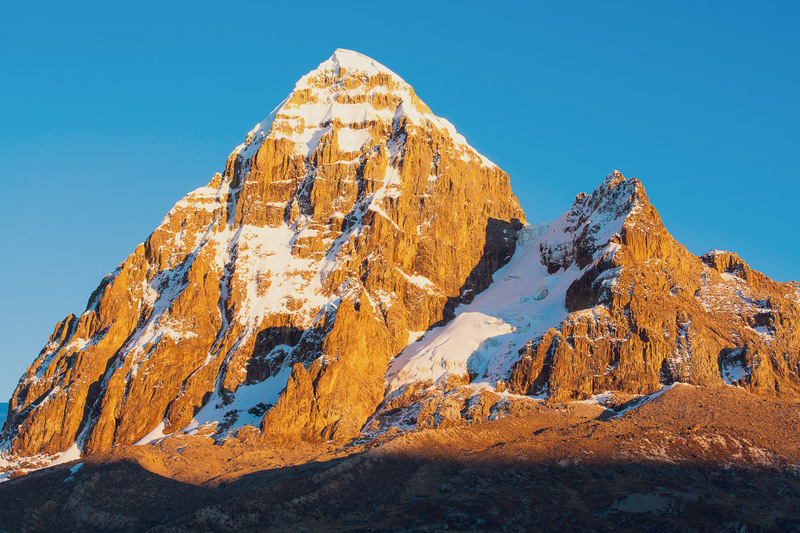 The first ascent of Yerupaja was in 1950, but it was a Kiwi team of Roger Bates and Graeme Dingle who bagged the first ascent of the north peak in 1968. Morning sunshine after a cold night at 4260m. 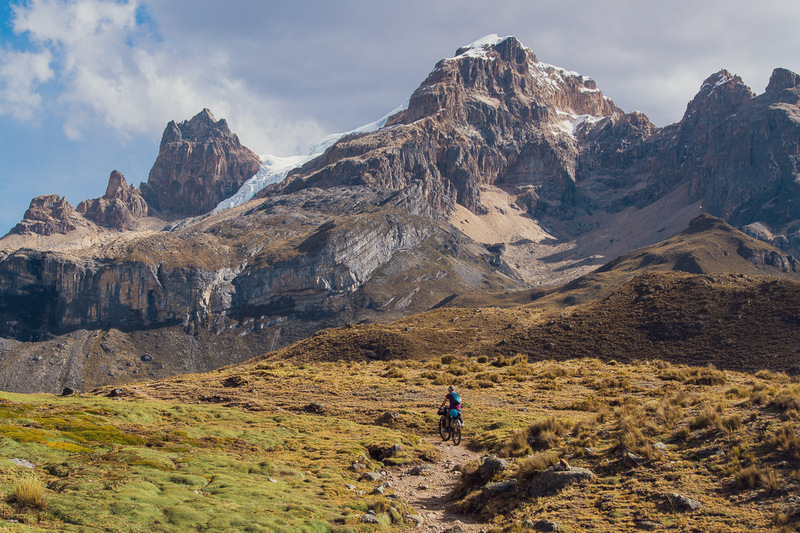 With another gorgeous morning we were back into it, descending from our campsite to the valley floor to pick up the track over Punta Carnicero. In places it turned into a jostle with the donkey trains which carry the trekkers supplies. 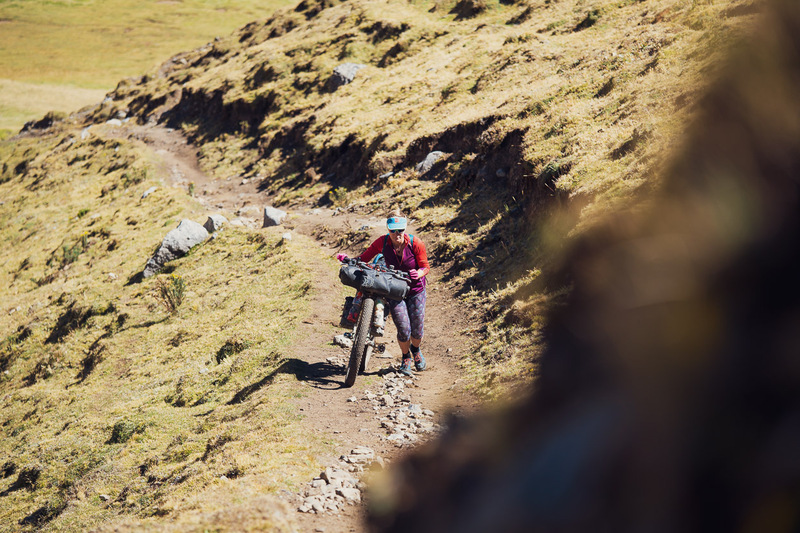 Note that in some sections, the trekking parties on the eastern side of the range take different routes that are either too steep or technical to make feasible riding (notable the Tres Lagunas section). 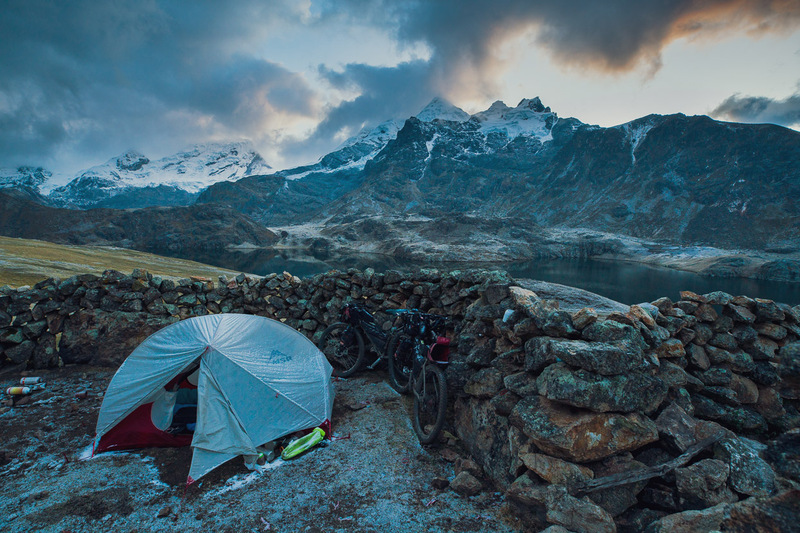 The most common bike packing route basically follows the packing route which supplies the camps. 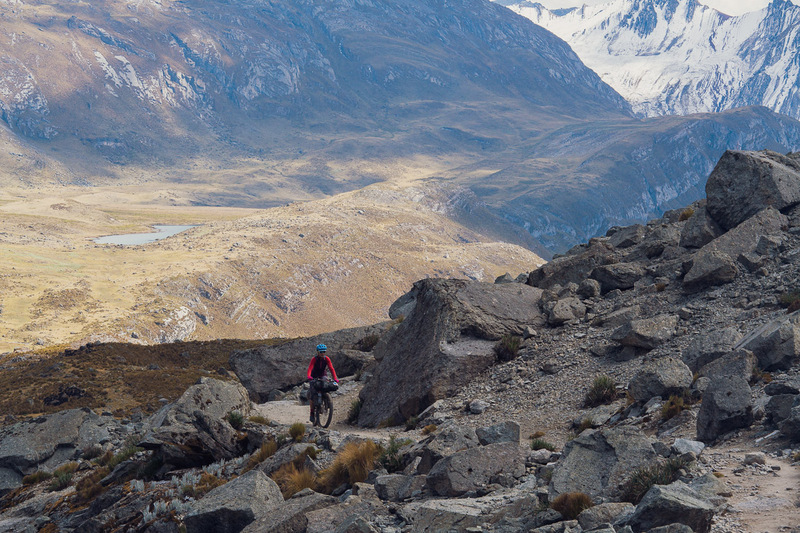 The first part of the climb to Punta Carnicero was the hardest section of hike-a-bike on our route. It took an hour and a half of pushing up a steep and sometimes loose track, until the angle eased enough that it was rideable. 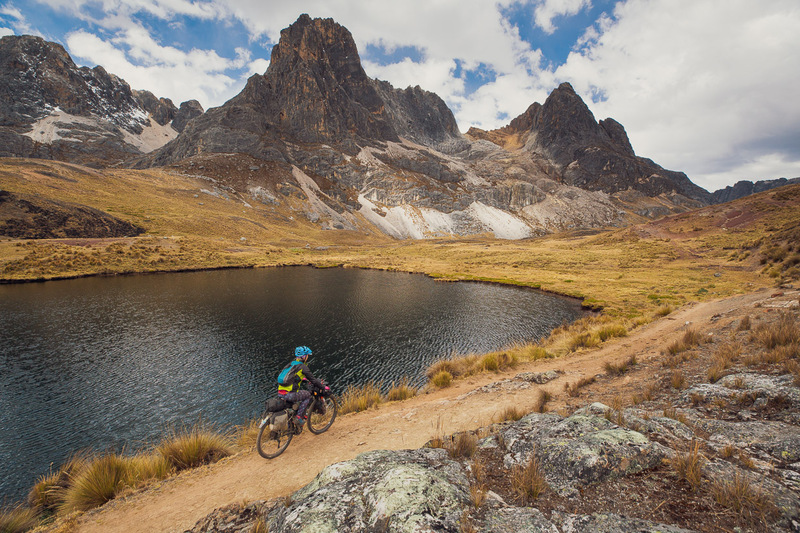 Mostly really pleasant 75% rideable single track followed as we crossed over Carnicero (4600m) and descended into a fairytale landscape of granite peaks, lakes and boulder fields on the other side – world class riding. Perfect riding in an amazing place. 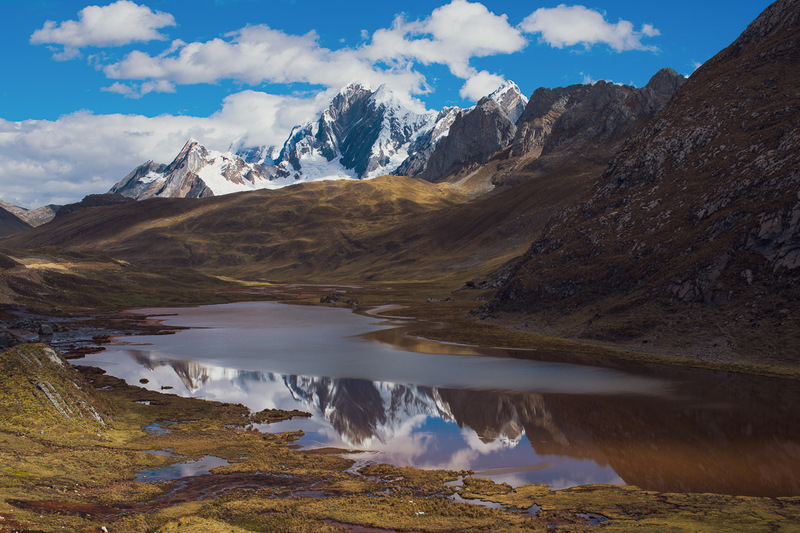 We passed through the Huayhuash trekkers campsite around mid afternoon and paid another 20 Soles each to the warden there. 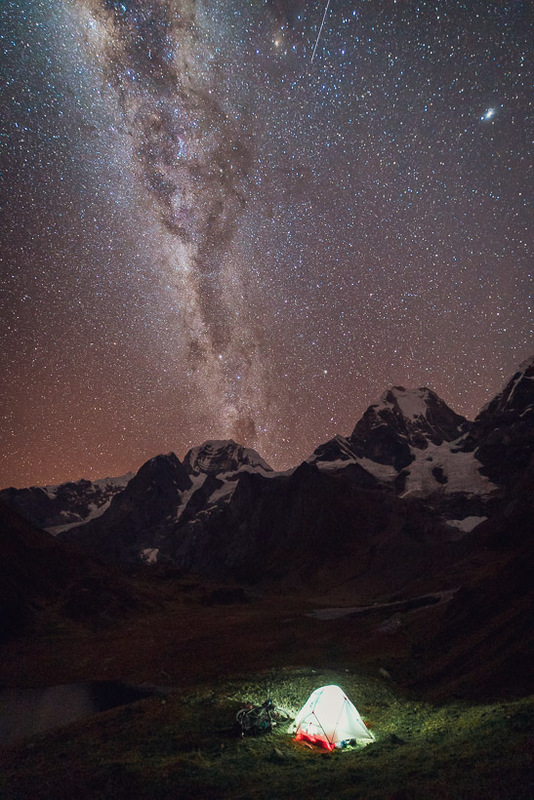 We were aiming to reach a pair of small lakes to camp at that night, so we pushed on up the hill away from the camp for about 20 minutes until it was rideable again, gaining height steadily as we did so. That evening a brief snow storm kicked up shortly after nightfall and coated our surroundings in a thin layer of white. 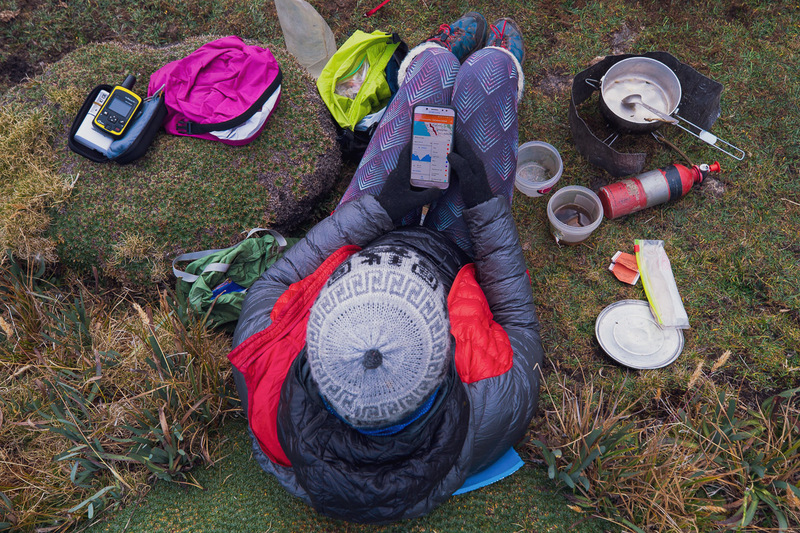 My slightly pared-back setup for the Huayhuash and our first couple of weeks on the Peru Divide. 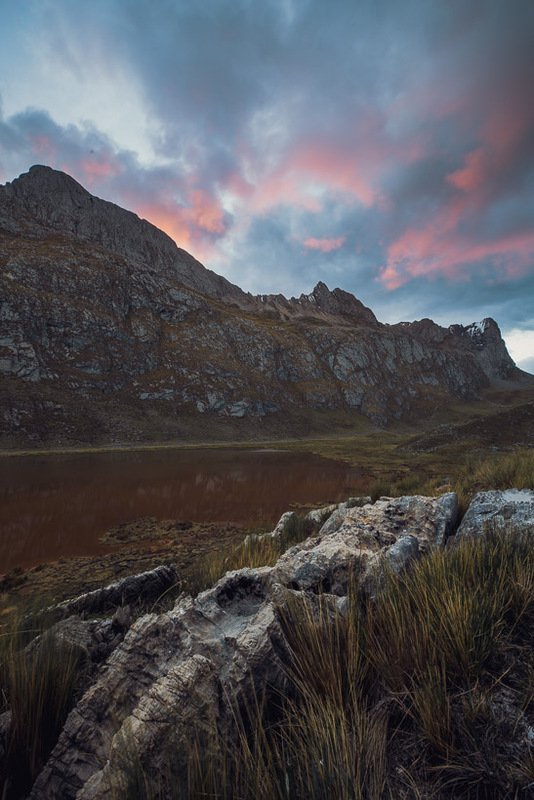 We left the laptop, HDs and other odds and ends in Huaraz to be brought to us by the film crew meeting us in Huancavelica. 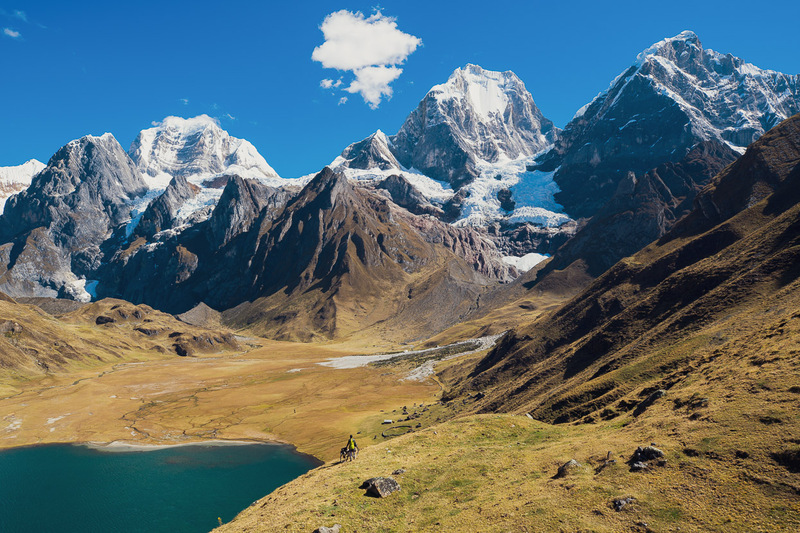 Travelling lighter for the Huayhuash was definitely a good call. While my bike’s still not light enough with my camera gear to comfortably carry for extended periods, it’s no problem for steep pushing and lifting over rock steps and boulders. 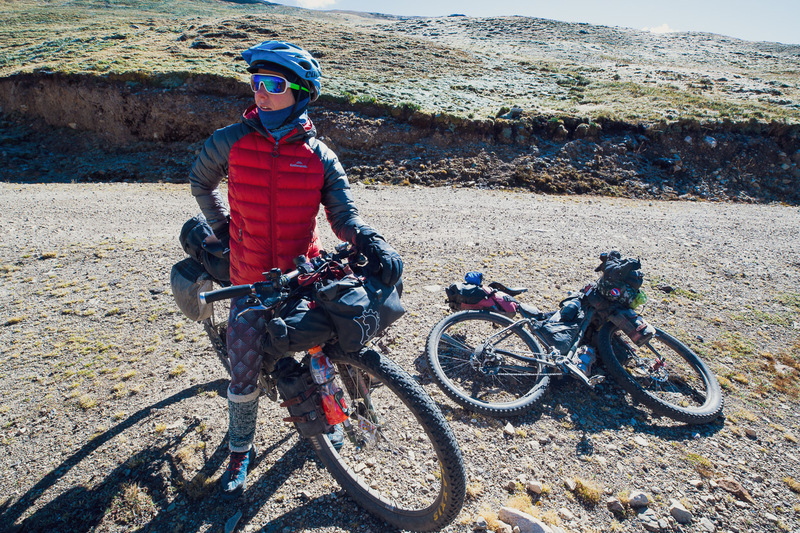 Hana’s trick has been to put the heavier items from her small Nano Panniers into a lightweight backpack, to make lifting and pushing her bike more manageable. The next morning we continued steadily uphill towards Huayhuash Pass at 4780m. We were pretty tired (being day four of hike-a-bike) on this one and alternated riding and pushing as we made our way up – but on the whole the trail surface here was pretty good. 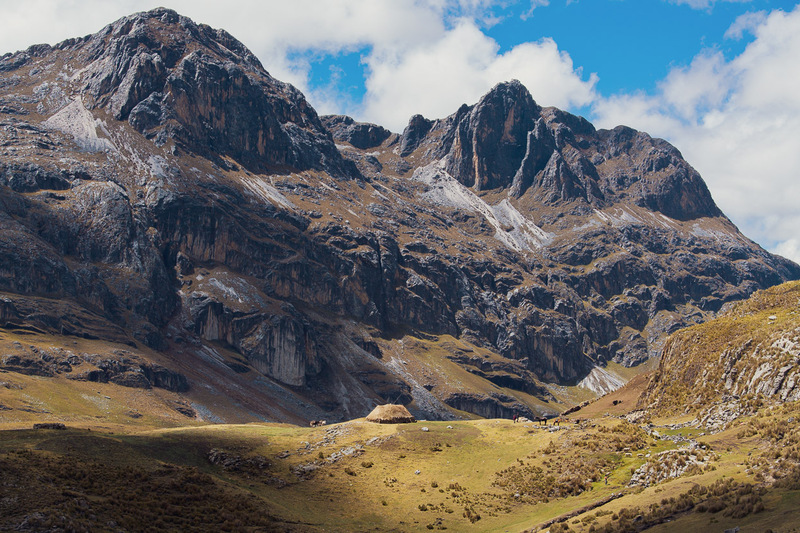 From the pass the view into the neighbouring range, the Cordillera Raura, was nothing short of spectacular. 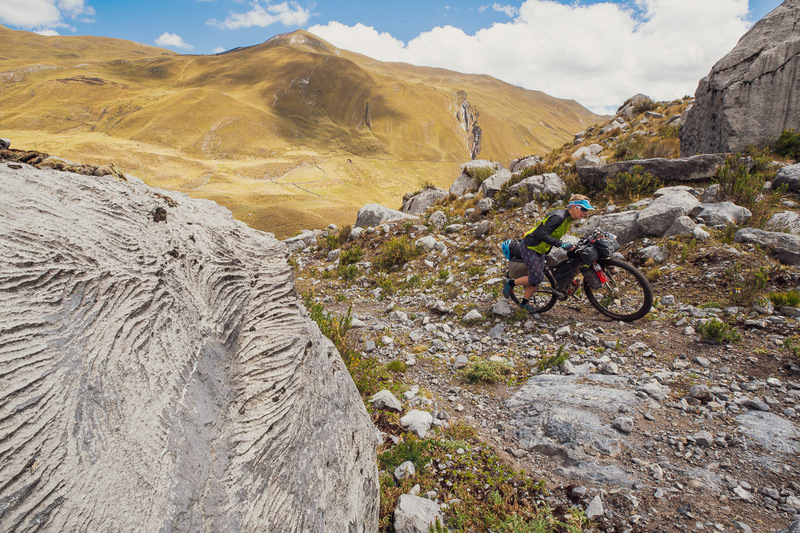 The descent was as good as one could hope for in a wild and ungroomed place, with a mix of smooth flowy bits, grassy pampa and technical, tight rocky corners that kept us concentrating. The descent took us down to Laguna Viconga. 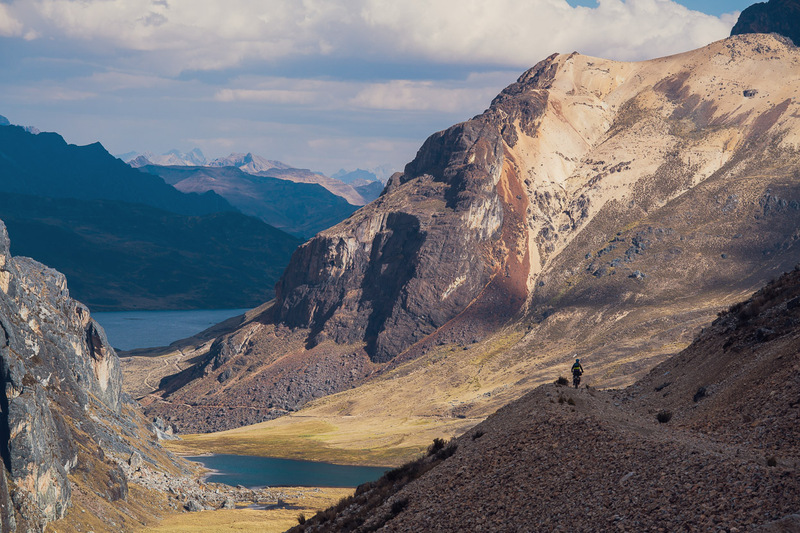 From there we crossed the piped outlet just below the dam and exited the Huayhuash Trekking Route via a route to the south east that passes Laguna Challhuacocha and crosses a final high pass at 4800m. 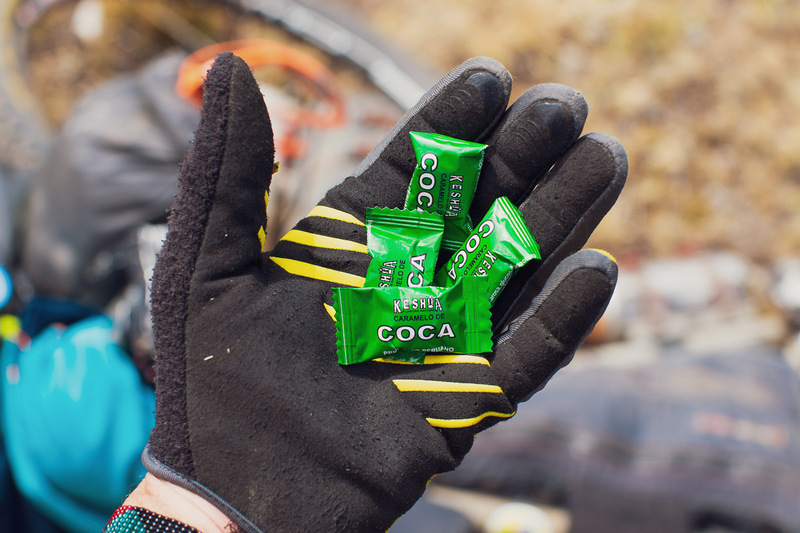 These little gems are our secret weapon for the high passes. Contemplating the tussock slog towards the last pass. 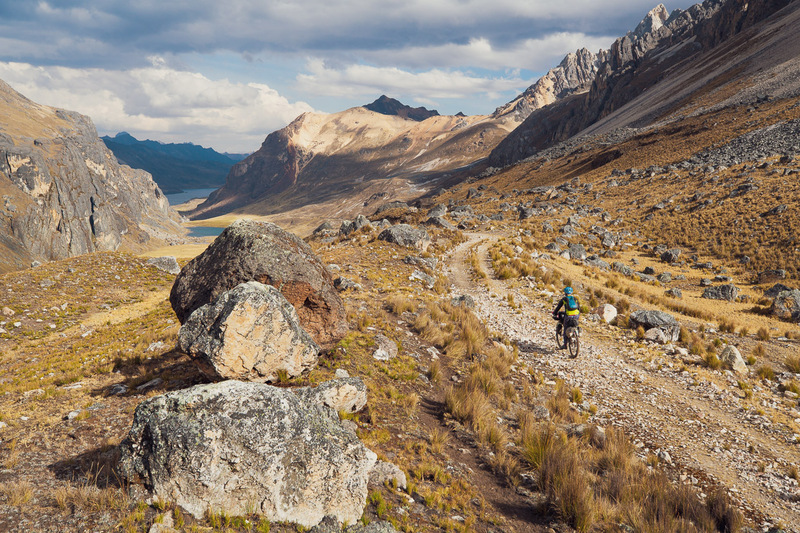 Between Lagunas Viconga and Purectishgo the single track fades away to pampa for about 500m until it reappears as a wider track. 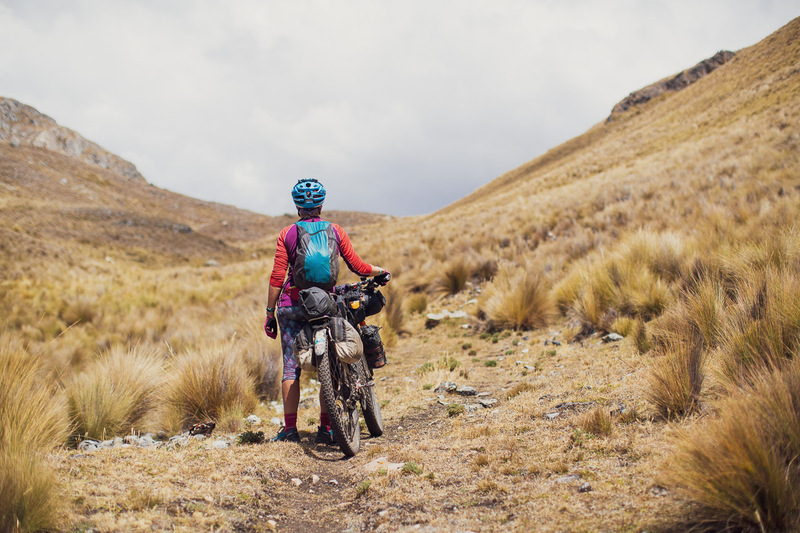 On this section we were surprised to see another – heavily loaded – cyclist bumping towards us over the tussock. 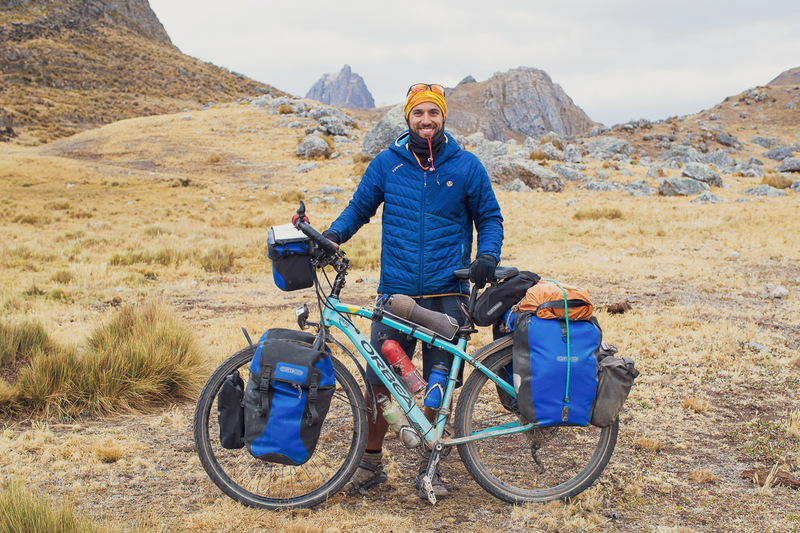 Javier (bicicleting on IG) has been on the road since 2010. It was a great meeting of kindred spirits in the middle of nowhere and we spent quite some time comparing notes and sharing info. Javier was heading north on the route we took and by the sounds of it was not quite as lucky with the weather. Below is the photo he took of us at the same location. We rode on into the afternoon. This section was a real surprise with great riding and more spectacular country. 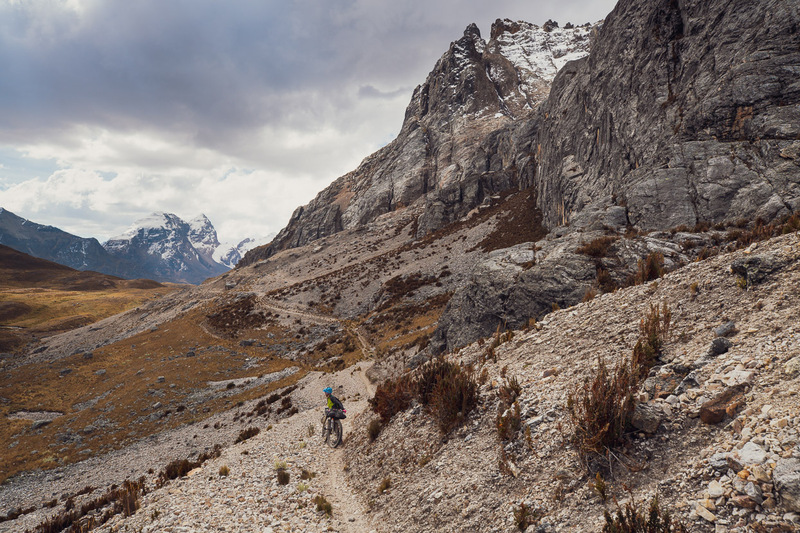 With the final 4800m highpoint ticked we dropped into a long descent towards Laguna Sura Saca which has a backdrop of the 5000m peaks of the Cordillera Raura. Even though it was only about 30km of mostly downhill riding to the town of Oyon, it was late in the day when we got to the lake so we opted for a final camp in the shelter of a sheep corral. Like the previous night, it snowed briefly just after dusk. Not much, but enough to leave us with an ice-covered fly in the morning. 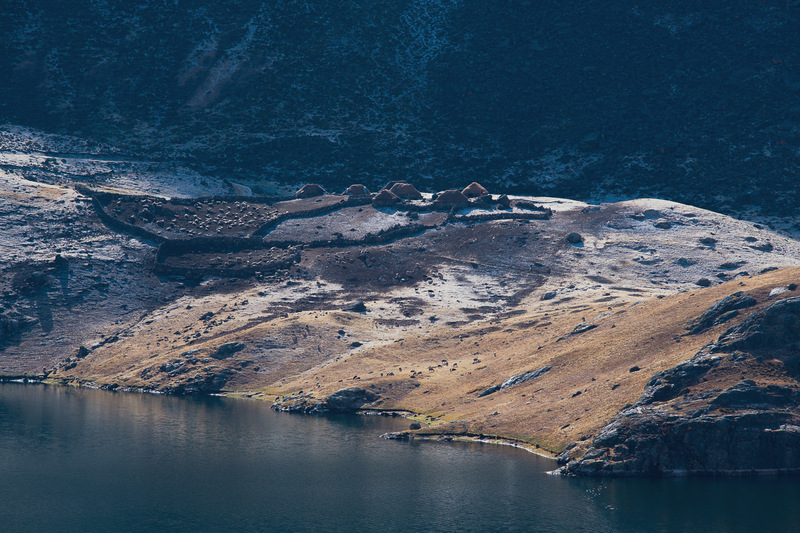 On the other side of the lake sat a group of chozitas, rock and thatch huts that are the typical dwelling for camelid and sheep farmers on the high pampa. It could have been a scene from medieval times. 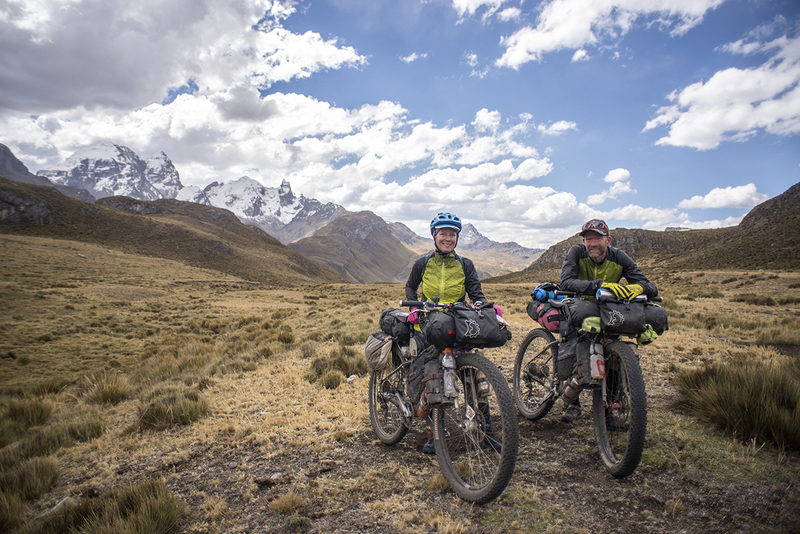 We reached Oyon early the next day and had a day and a half of rest there before tackling what’s been an incredible few weeks on the Peru Divide route since. More on that soon. Thanks for reading. Thanks to While Out Riding and Fat Cycling for blog posts which helped us plan our ride. Creating content for this site – as much as we love it – is time consuming and adds to travel costs. Every little bit helps, and your contributions motivate us to work on more bicycle travel-related content. Up coming: Gear reviews and GPX tracks. Thanks for sharing the route, the story and the great photos. Sounds amazing. But wondering if only doable with the setup and bikes like yours. We would love to do this but definitely need to downsize. Could you share the gox but not in ridebygps? Thanks again for sharing this great route. Ps now in Colombia. Did GDMR, bit of Baja Divide, here lots of dirt roads, also part of ohboyaca but no single tracks. Would this be too technical? Hi Jacinta – no problem and thanks! Yeah I do think (most) heavily loaded riders would not have a good time with this route. The pushing is steep and would be slow and tedious with a big load. Definitely best to lighten up for this one. 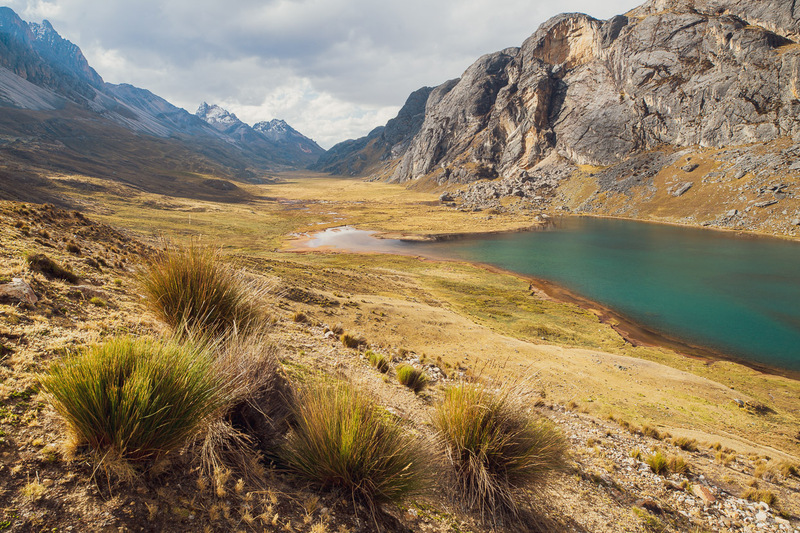 We have used local couriers in Peru (Olva) with reliability as well as sending things ahead to Warmshowers Hosts or hostals throughout the Americas. 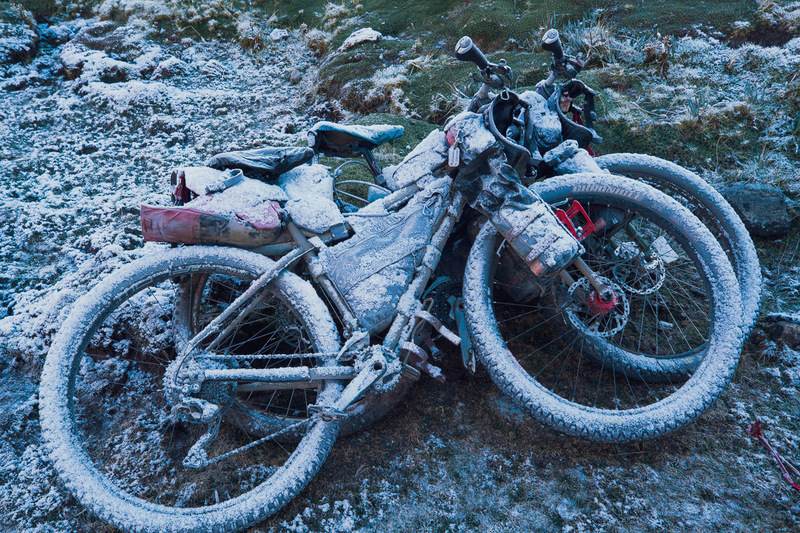 The other reason not to ride with a heavy load on this terrain is to avoid bike breakages. A lot of the descending is moderate technical to quite technical and is more rideable and fun with a light load. Jacinta – I did it on a somewhat fully loaded Salsa Fargo, (panniers on the rear, 5L dry bags on the front) and was able to ride a fair amount, though not as much as Mark and Hana did. Like them, I had also done some hike-a-bike in the lead-up and there was only one bit on this route that was a tough as what I’d experienced before. 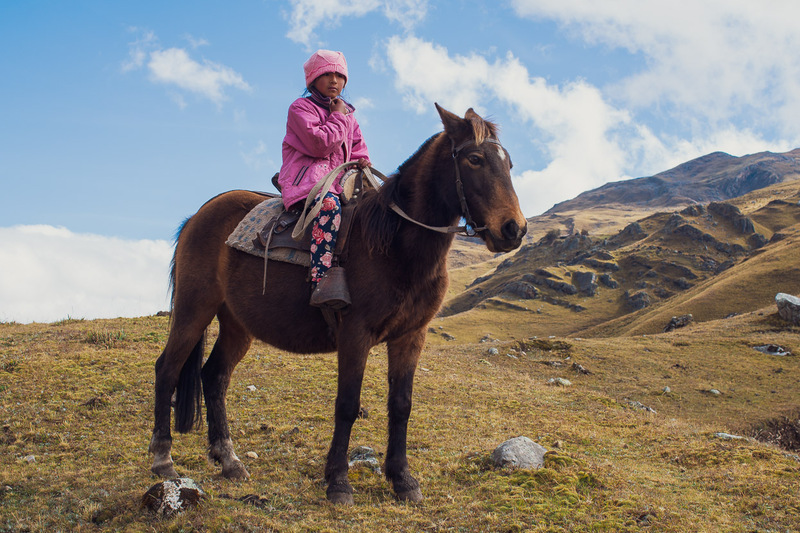 The first two passes were fairly easy (some pushing, but nothing too bad), but the third, to Punta Carnicero, was very hard and I hired a local farmer to carry my bags up with his horse rather than struggle with my full load. After that it leveled out and I could ride a decent amount. I found the descents mostly rideable, though I come from a mountain biking background, so I’m used to riding single track. 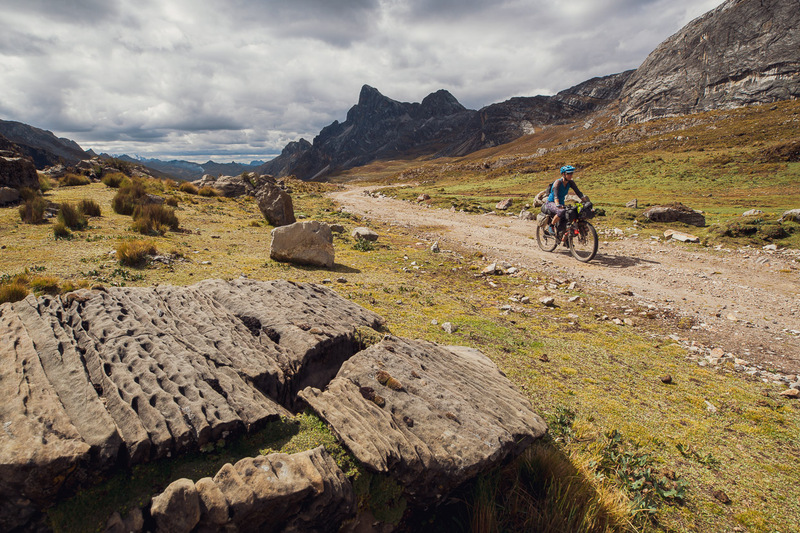 Unfortunately, on my way down from Punta Carnicero to the Huayhuash campsite, my rear rim cracked in two spots so that was pretty much the end of my riding. I was lucky that a guided group was at the campsite and I was able to load my bags onto their donkeys for the hike to the next campsite at a set of hot springs. From there, I took an old road to Cajatambo instead of the route to Oyon, since it was a little closer and involved almost no pushing. All that said, it’s an absolutely spectacular route with some of the best scenery I’ve ever experienced. It was hard, but worth it. 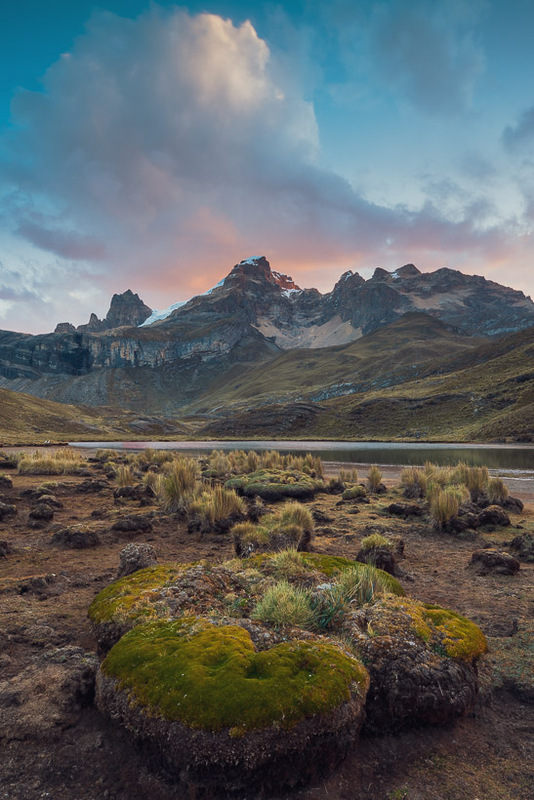 If I were to do it again, I’d hire someone to carry my gear from Laguna Carhuacocha to the Huayhuash campsite so I could hike unburdened via the Tres Lagunas route, which is the one the trekkers follow. PS. Once again, thanks for the great pictures Mark & Hana. Phew,I feel exhausted just reading. whilst I lift my lid & admire your amazing achievements , I’m somewhat mountained out !! 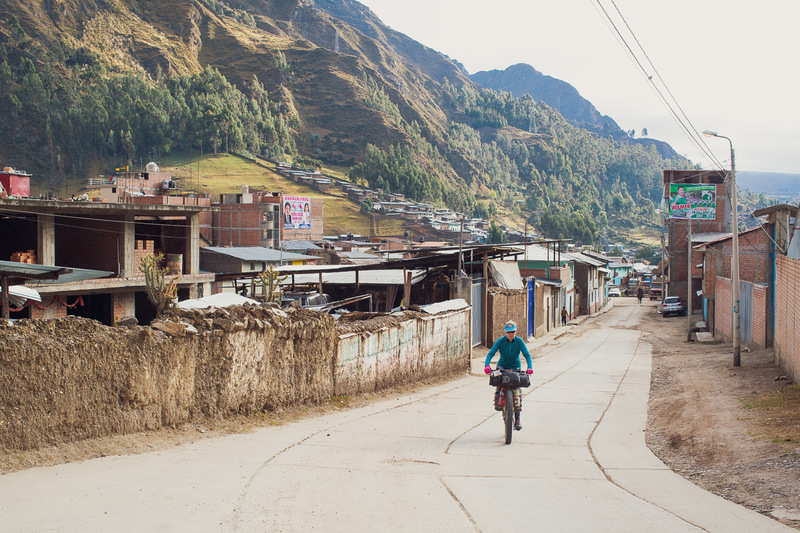 I long to see some ordinary villages & Peruvians ! Travel safely & keep up the good work – writing & photography. Thanks Matthew! Will do – it would be good to write up a summary of the food challenges! Hi Simon, Thanks. Glad it’s been helpful. Yeah no problem at all for you to use our track. You can copy it from Google My Maps into your own Google account and then download as KML. If it’s easier I can email you a GPX. Let me know. Good luck with the prep and planning. Oh Boyaca is a brilliant ride. thanks for these travel impressions. 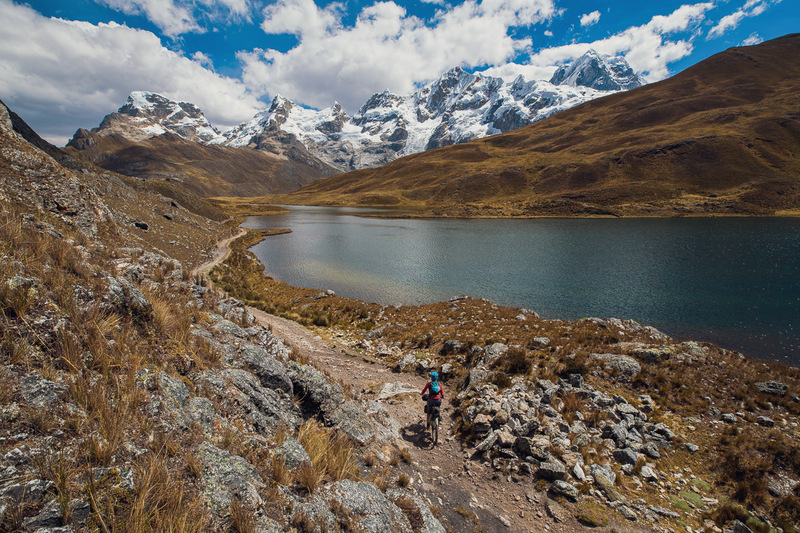 We were in the Huaraz region this year for the third time and did a self organized four weeks loop around the Huayhuash and Raura range but without tents, so we did not directly get in touch with this famous track. It is now clear what we missed ;-). Btw, last weekend I did a OSM coverage review of your complete Peru/Bolivia GPS track and could improve the map at several stretches. After spending some hours of work, I guess the OSM “compliance” is now at a 99,99 % level. 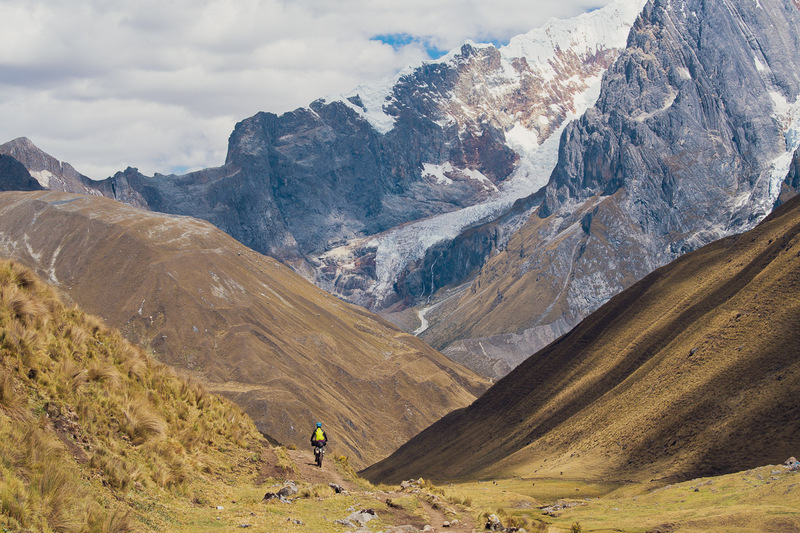 The above mentioned “road” is now a path again and thanks to your track I could also close the gap near Laguna Challhuacocha. So the Huallanca/Oyon section now is completely routable (111 km). Regarding OSM contributions, even uploading a high resolution GPS-track can help, as some of the aerial images are old, have cloud cover or distortion due to orthogonalization algorithms. Hi Guido – that’s fantastic to hear and I’m really glad our tracks have been useful to improved the OSM coverage! Thanks for putting in the time! 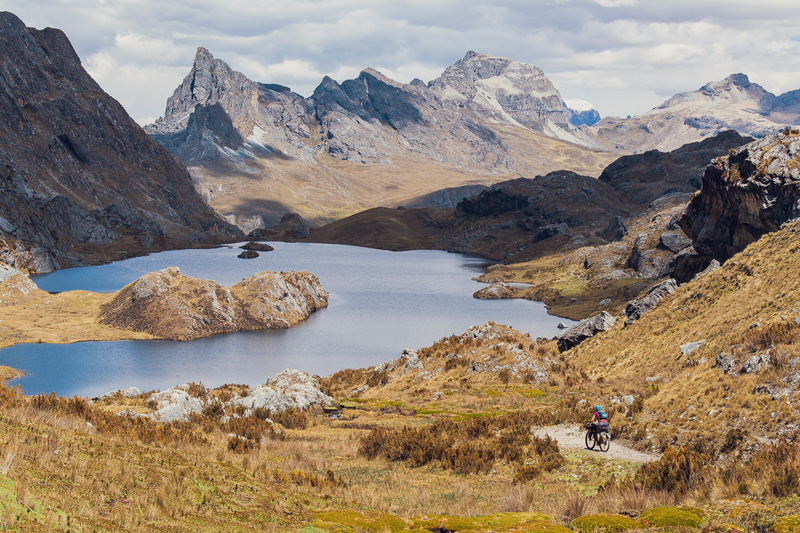 Yes the Cordillera Huayhuash Is very special, and we didn’t even see the best bits (Tres Laginas etc) due to difficulty of access with bikes.